Keeping tabs on your social media connections these days is like bar hopping, without the cocktails or pool tables with stained felt. You run over to check your Twitter account. Then you dash to Facebook to see what’s going on there. Then Linkedin. Maybe your blog. All the while you’re feeling like you’re playing catch-up, that something awesome may have happened, and you missed it because you weren’t online. Sound familiar? For normal humans that check social media a couple times a day, NutshellMail may become your new favorite social companion. And it’s free. 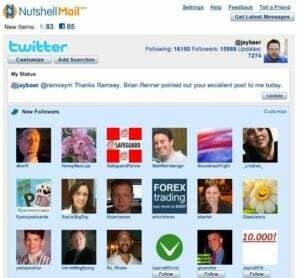 NutshellMail sends you a highly customizable email digest (from 1 to 24 times per day) of what’s happening in your social media spheres, so you can browse and get up to speed quickly, without having to visit several different destinations or fire up your iPhone’s social apps. Want to know who has signed up to follow you on Twitter today? Who unfollowed you today? All the DMs and @ replies you received in the last three hours? NutshellMail batches it all up and sends it to you in a tidy email at the exact time of your choosing. You can even include Twitter searches in your feed, enabling you to use NutshellMail the same way you’d use TweetBeep, or an RSS feed of Twitter search results. It’s pretty tough to find a credible excuse for missing people’s birthdays on Facebook. NutshellMail saves you from being labeled an ingrate by reminding you of all the birthdays of your Facebook friends this week. The email also can be configured to show you all new friend requests, status updates from pages that you’re a fan of, as well as photos, videos and links from your friends. Plus, event invites, and photos in which you’re tagged. Although I’m not using it presently, you can also configure your NutshellMail to include Linkedin and MySpace content, as well as updates from the Ning groups of which you are a member. Also, if you have several different email accounts, you can use NutshellMail to automatically combine the emails sent to your secondary and tertiary accounts and forward them together to your primary account. All the content shown in each email is clickable. So, if you want to see more about a new Twitter follower, you can simply click the name or photo in the email, and instantly visit their bio. You can also manage your customization preferences by clicking links in the email, so visiting the NutshellMail Web site isn’t needed after initial sign-up. 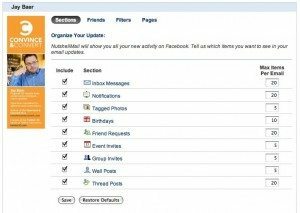 One of the outstanding new add-on features of NutshellMail is their Facebook app, which enables Facebook fan page managers to easily add an email newsletter tab to the page. Subscribers then receive a digest of all the content posted to the fan page. I’ve been talking a lot about the integration of email and social media, and this is another example of using cross-functional technology to build content creation and deployment synergies. Note that NutshellMail is funded in part by FBFund, Facebook’s venture capital arm. Here’s a nice video demonstration of NutshellMail and how it can save you time and social media aggravation. I’ve been using NutshellMail for a few weeks now, and find it indispensible. (Thanks to my friend Will Smith – the world’s second most popular Will Smith – for turning me on to it). How can you make use of NutshellMail to simplify your social media chores?